Are you planning to be pregnant, pregnant already or know someone who is pregnant? Have you heard about hypnobirthing but you’re not quite sure what it is? Have you wondered why you should do a hypnobirthing course? Then keep reading, as I would like to explain what hypnobirthing is and how it can benefit you (or any woman, for that matter). If you’re a first-time mum, you are most likely wondering if hypnobirthing can help you prepare for labour and birth. Yes it can! Maybe you have a family already, but you gave birth to them without using hypnobirthing techniques. Perhaps you want to know whether doing hypnobirthing classes could give you a better birth experience, because you have heard other people say great things about them. Yes it can! Or maybe you know someone who is pregnant and you want to find out how learning hypnobirthing can support her. Perhaps the road to pregnancy has been a bumpy one. Hypnobirthing can benefit each and every expectant mum, regardless of her pregnancy journey so far. If your road has had a few bumps along the way, hypnobirthing can give you the support that you need to reassure you through pregnancy and prepare you for labour with a calmer approach. While the word ‘hypnobirthing’ can be misleading, a hypnobirthing course is a down-to-earth and practical approach to understanding and appreciating pregnancy and labour as a natural process. Statistically, very few women need medical assistance to give birth to their baby and thousands of women around the world are choosing to reconnect with their intuitive side and find a new approach to welcoming labour and birth with calm confidence. I can confidently say that hypnobirthing works. I applied hypnobirthing to both my pregnancies and labour, and I can clearly see how it helped me deal with those experiences and allowed me to look back at those labours with fondness and happiness – understanding when hypnobirthing supported me. Yes it sounds a bit ‘out there’ but seriously it isn’t — the crux of it is straightforward, logical, natural and quite normal actually. So if you’re still wondering whether hypnobirthing is for you or not, think no more. It is! Despite the word being linked specifically to birth, hypnobirthing is a skill for life. You can use the relaxation and visualisation techniques in any number of situations such as: at the dentist, during breastfeeding, when trying to fall asleep and in stressful situations. In my book The Power of Hypnobirthing: 10 reasons why it’s for you, I explain in detail 10 indisputable reasons why you should book yourself onto a hypnobirthing course. By reading this book, you’ll understand how to bring your birth partner into the centre of this experience, so that they can fully support you and your baby during labour, birth and beyond. You’ll also realise that the midwifery care that we receive, whilst mostly brilliant and supportive, can sometimes lead a woman down a path of care where she is not presented with the full picture. Unfortunately, overstretched midwives simply don’t always have the time to explain and offer options. A hypnobirthing course will give you the full picture — you’ll get all the facts and head into your birth with a toolkit of knowledge, options and techniques to achieve a calm and positive birth experience, no matter what scenarios/circumstances are presented to you, and if you want to do further reading around a subject, your instructor can point you in the right direction. A hypnobirthing course presents all sides of the story and clarifies the risks and benefits of most situations. It explains that there are often alternatives too, which are not necessarily offered to you on your birthing day. This is why it is such a good idea to invest in a course — it enables you to explore most likely situations and make decisions, knowing all the facts beforehand. Not only do my courses offer relaxation and visualisation techniques for labour and birth, but I also ensure that all my couples have a clear and balanced picture of the scenarios that might play out during labour and birth, so that they go into this experience with their eyes wide open, their research done and their choices respected. Unlike most hypnobirthing courses, Magical Baby Moments’ courses also offer top tips for looking after a newborn! Now don’t just take my word for it, here are some testimonials from past clients. If you want to know more about finding out if hypnobirthing is for you, regardless of age, pregnancy symptoms, BMI (Body Mass Index), lifestyle, beliefs, preferred place of birth etc, buy the book to change the way you think about birth and hypnobirthing, and quite possibly change your life! Or if you are ready to take the leap now and you live close to Romford or Upminster in Essex, book your hypnobirthing classes. This summer, I read The Microbiome Effect by Toni Harman and Alex Wakeford. This is a fascinating account of emerging research that shows how vital bacteria are for human health. Our exposure to them during labour, birth and beyond helps kick-start our developing immune system. This book reveals the impact of babies born via Caesarean Section (C-Section) and how this potentially alters the course of their immune development and makes them more susceptible to non-communicable diseases. Here is my synopsis, of what I believe is a must-read for all birth educators and expectant parents, to understand the intricacies of a vaginal birth and the vital components that help your baby thrive in the outside world. Human bodies are comprised of trillions of human cells and microbes (bacteria, viruses, archaea, fungi etc). These cells and microbes live on and inside us. The bacteria inside our body help keep us functioning properly and give us the ability to fight off diseases. However, modern ways of living, such as diet, antibiotics and C-sections – to name a few – are adjusting the diversity of microbiomes in the human body. Current research indicates that this alteration in the way we live is giving rise to many common non-communicable diseases such as allergies, asthma, auto-immune disorders, diabetes, obesity and more. For a long time, antenatal educators have explained to its parents-to-be the benefits of a vaginal birth vs a C-section birth, in regards to babies breathing abilities. In a vaginal birth, the birth canal compresses the lungs to expel the liquid that has been in them during pregnancy; so that once earth-side, the lungs are fairly clear of liquid and breathing unassisted comes more easily. The research conducted, which is discussed in this book, digs deeper. It looks into many other vital stages that a baby encounters during a vaginal birth, which can impact his/her long-term health positively. Other scientific tests are indicating that there is a link with an imbalance in the human microbiome (often caused via Caesarean section deliveries) and with chronic non-transmissible diseases. It is believed that during pregnancy a baby lives in a near sterile environment and exposure to microbiomes is minimal. It is during a vaginal birth, once the amniotic sac had ruptured, that a baby begins to be exposed to bacteria. This is when it comes into contact with vaginal, faecal and skin microbes. These enter the baby’s eyes, ears, nose, as well as being swallowed through the mouth. This prenatal exposure is one of the main seeding events for the baby’s gut. Once the baby is born it will come into contact with more bacteria – from the air in the place of birth, from the skin of its caregivers and parents etc. All of these encounters help to colonise the baby’s gut. Babies born via a Caesarean section (C-section) potentially miss out on this exposure, if the amniotic sac hasn’t ruptured, because they won’t come into contact with the mother’s vaginal or intestinal microbes. As a result the baby’s gut microbiome composition will be different. Latest research favours infants that are born via C-section to have skin-to-skin contact and breastfeeding where possible, because the second major influx of microbes is during these two events (babies born vaginally are also recommended to do this too). During skin-to-skin contact, and when a baby is looking for milk, it will open its mouth and suckle or lick the mother’s skin. A mother’s breastmilk is incredibly rich. It provides essential nutrients for the baby’s growth and development, including key immune components and sugars. The sugars not only provide energy for the baby, but it also feeds the bacteria in the gut, quickly colonising it and preventing other harmful bacteria from taking hold. These events and opportunities to come into contact with the right bacteria kick-starts the continued development of the infant immune system. The bacteria teach the immune system to recognise friendly and harmful bacteria, and know what to attack, or not. In contrast, a baby that is fed formula milk will only receive the nutritional benefits. This milk is missing prebiotics to feed the gut microbes. It also lacks the right bacterial species and immune components that the developing baby needs. These missing components could impact the training of the infant immune system, which could mean health implications later in life. All the way through pregnancy, labour, birth and infancy things are supposed to happen at certain times. When the birth process is interrupted with medical intervention, the evolution of the immune system is disturbed, which could result in it malfunctioning later in life. Research has also shown that the microbial profile of a baby born vaginally resembles that of its mother, and continues to do so with each generation that is born vaginally. However when this pattern is interrupted by a C-section delivery, the child may not match the mother’s microbial profile and the child may fail to inherit critical “keystone” species of bacteria to ensure good health. C-sections could be contributing to key microbe species being lost, making us more susceptible to pandemics. Other evidence suggests a correlation in C-section babies having a higher risk of developing asthma, type one diabetes or coeliac disease, and of becoming overweight or obese. This is not to say that all babies born this way will go one to develop any of these, they are simply more susceptible. What we don’t know yet is the ongoing repercussions of this. As an antenatal educator, I feel it is my duty to inform my parents of the potential health implications of babies born via a C-section. Parents need to better understand the importance of vaginal births, as a way to ensure that their baby receives the necessary exposure to bacteria, which will help colonise its gut in the right way – to ensure a fully functioning immune system. There will always be world in which some babies are needed to be delivered via C-section, therefore what steps can the caregivers take to help the baby receive optimal seeding and feeding? Mothers can be tested to see if they are suitable for “swab-seeding” (this is currently under a strict protocol). However for the feeding aspect, there is now no reason why babies cannot be passed to mothers straight away in all elective C-sections (and some in emergency C-sections); so that the baby can have skin-to-skin contact and have the opportunity to begin breastfeeding. This will allow the baby to be exposed to essential bacteria and microbes and helping to kick-start an immune system that could keep them healthy throughout their life. This article only scratches the surface and highlights the key points of the book. I strongly recommend mothers to read it and learn more about it. Ask your midwife and/or obstetrician how much they know about this subject. If they don’t know too much about this subject, politely ask them to do their research. Your baby’s life is in their hands. The Microbiome Effect is published by Pinter and Martin and is available on their website. As your pregnancy progresses, you are probably reading books about how your pregnancy is progressing and how you can better prepare yourself for labour and birth. These days there is a lot of choice. Some parents to be attend NCT (National Childcare Trust) classes, some choose ParentCraft, offered by NHS midwives and others choose hypnobirthing. Each have their own way of explaining what to expect from labour and birth and offer slightly different things. If you would like to know 10 reasons what Hypnobirthing Course can offer you, you can buy this introductory book: The Power of Hypnobirthing: 10 reasons why it’s for you for only £5.99 (on the Kindle or in paperback*). Magical Baby Moments Hypnobirthing Course teaches its expectant parents about the benefits of using positive birth statements. Positive birth affirmations are an effective way of keeping focused and in the right mindset. They are a powerful way to train your mind to move out of the way of your body; to let nature take its course. Many women who had their minds in the right space created smoother, shorter and less challenging labour experiences than women who hadn’t known about affirmations. Sadly, my creativity skills stopped around the time I passed the pre-schooler age! So when We the Parents got in touch with their stunning poster, I couldn’t not share it. Here’s a beautiful and complete list of positive birthing affirmations, aggregated from different sources, for you to use so you can get on with feeling calm and prepared for your incredible labour and birth. Who are We the Parents? Neve and Keane created this blog in order to share some of their experiences and learning, as they navigate the sometimes crazy world of raising a family. In doing so, they hope to save you a little confusion, weariness and time. On 20 July 2017, I attended the Positive Birth Conference at City University in London. I just love being around birthing professionals and feeding off their knowledge and enthusiasm, and this conference was no disappointment. The themes of the day centred very much on what women are looking for when it comes to their birth experience and how to potentially give them a better birth experience. This was approached from many angles, including continuity of care. The presentations and discussions challenged where the line for this currently stops and where more could be done to improve this. So what are women looking for? Choices regarding her place of birth have been identified as an area for improvement. Not all women report having made a choice – and the decision that women make is not neutral. Many factors can influence a woman’s decision. The crux of it is; choices are constrained by reality (e.g. choice of place of birth is not available, classification of mothers (low risk/high risk) may rule out the birth centre, for example). The Better Birth initiative states that women should have three choices of place of birth, NICE – the National Institute for Health and Clinical Excellence – recommends four: Obstetric Unit (hospital), Alongside Maternity Unit (birth centre within a hospital0, Freestanding Maternity Unit (standalone birth centre), Home. Regardless of where women are in the country, they should be able to make a choice from all offerings. Midwives are advised not to just accept women asking for what they want but to ask them to explain why they have made that choice. The midwife should then ensure that the benefits and potential risks of that choice are understood, as well as making certain that all other choices have been explained in the same way. This allows the woman to make choices in an informed way and that she has the full scope of options first. The she can reaffirm her final decision on where to birth. Some areas of the UK are criticised for lack of continuity in antenatal care, though this is starting to be addressed in some Trusts with the reintroduction of case-loading (seeing the same midwife/small team of midwives throughout a woman’s pregnancy). However it felt that more could be done to ensure a woman is given the right care during pregnancy and a smoother handover from the midwives to the health visitors, so that upon the first appointment with a health visitor they are already aware of the woman’s pregnancy and birth experience. Location of appointments: meeting their caregivers in the same location for antenatal appointment was not important to them; however home visits after birth is appreciated. Staff: When considering the transition from midwife to health visitor, face-to-face contact with health visitor in pregnancy is not needed. An introduction via post or email would be welcome. New mums would appreciate not having to repeat their medical history to the health visitor and would appreciate a better hand over from the midwife. Some said it would be helpful to the first meeting with both professionals together – especially for women have had traumatic experiences. Most respondents had a named midwife, this was not important to all of them. Continuity of care is also especially important in women who have experienced some degree of trauma. Birth Trauma: Risk and Resilience in Women was the theme of Professor Ayers presentation. She shared her research on women who have suffered some degree of trauma during labour and birth and who have as a result experienced Post Traumatic Stress Disorder (PTSD). Evidence shows that 4% of women experience Post Traumatic Stress Disorder (PTSD) in pregnancy and a further 3-4% develop PTSD as a result of birth. However, most women who have a traumatic birth don’t go on to develop PTSD (55%). Risk and resilience factors have been identified during the study and medical professionals can use these findings to prevent PTSD and enhance positive outcomes. The events that occur during pregnancy and birth are important, as these are what contribute to Post Traumatic Stress Disorder and Post Natal Depression. Although much of this is based on the individual’s subjective thoughts around the events, rather than the events in themselves (some women are more acute to situations than others and it may not be the event in isolation but a number of factors that have added to the woman’s life experiences). Even though it has been cited that 3-4% of women can experience PTSD in pregnancy, this can be as high as 39% for those who have a history of abuse. Stress in pregnancy is known to carry over to baby. Evidence shows that these babies have an increased response to stress, which carries into their later lives. We hear often about war veterans suffering from PTSD and ongoing drives to raise funds to support to these individuals. However, in terms of number of individuals, this perceived low percentage of women who suffer from PTSD is much, much higher than those of veterans. Resources need to be found in order to support these women better. Ayers research has delved into analysing the care that women received after birth and what positive impact this has had. For those that have received support, a pattern that has emerged. Women who experience birth trauma and who receive support, find strength and resilience to move forward and give meaning to that event, which often sees the woman experience growth from that crisis. So how can risk be reduced? As a result of this study, a framework has been put together to identify those women who are potentially at risk in order to customise their care during, pregnancy, birth, postnatally, all of which needs to be fed back into the services to build up more expertise. The conclusion was that with this new insight, we can develop personalised care when we have identified women at risk, and by offering them the correct support maternity services can enhance positive outcomes. Octavia Wiseman, spoke to us about the REACH Pregnancy Programme, which is a five year study, currently about half way. The aim is to find these women living amongst us and offer them the antenatal care that they may otherwise miss out on. The study is also trialling Pregnancy Circles, which brings together pregnant women who are at similar stages in pregnancy and who live near each other, for clinical care, information-sharing and social support. The Pregnancy Circles aim to provide a woman-friendly, community environment for antenatal care. These meetings are 2 hours long, rather than the 15 minute appointments expectant mums would normally receive. So far these meetings have been positively welcomed. As a co-cost of Havering’s The Positive Movement, it was a personal delight to hear the final speaker of the day Milli Hill. It was great to hear how she has inspired so many women to take up her movement and bring women together to look at birth positively. She centred her presentation on Carl Jung’s Shadow Theory. Jung saw quite clearly that failure to recognise, acknowledge and deal with shadow elements is often the root of problems between individuals and within groups and organisations. Hill challenged us to consider the shadows in birth, midwifery and within ourselves. It was a really interesting day and in the two years that I have been a part of this industry I continue to learn so much from my peers. My wish however, would be to see a maternity care that is stripped of the red tape, so that the midwives who go into the profession wanting to be with women, can dedicate their time caring for them throughout their journeys. Continuous care is not a new thing, better births is what we all strive for. These conferences help solidify our ambitions towards a positive birth experience, if only it could happen a little faster. If you are expecting a baby in the next two months and you’re looking for a calm and positive birth experience, then book yourself on a Hypnobirthing Course. If you’re located near Romford in Essex, come and join Magical Baby Moments at The Upminster Sanctuary, on 22/23 July for a weekend hypnobirthing course. The expectant mum and her birth partner will learn practical tips to stay relaxed, focused and positive in late pregnancy, labour and birth and they will come away completely informed about the possible scenarios that may arise during labour; so that they know how to make decisions wisely that are right for both mum and baby. A hypnobirthing course is a fully rounded antenatal course, covering all the topics and more that you will learn on either an NCT or Parent Craft course. If you want a course that gives you the facts about labour and birth, arms you with the information and questions to ask your caregivers, should things deviate from your plans and empowers you to take control of your birth then look no further. Our last group course, before the summer break, is in just a couple of weeks, taking place on 22/23 July. Take a look at the course modules and book your place today. If you want to hear what couples who have done a Magical Baby Moments Hypnobirthing Course thought about the course, take a look at the birth stories and testimonials. 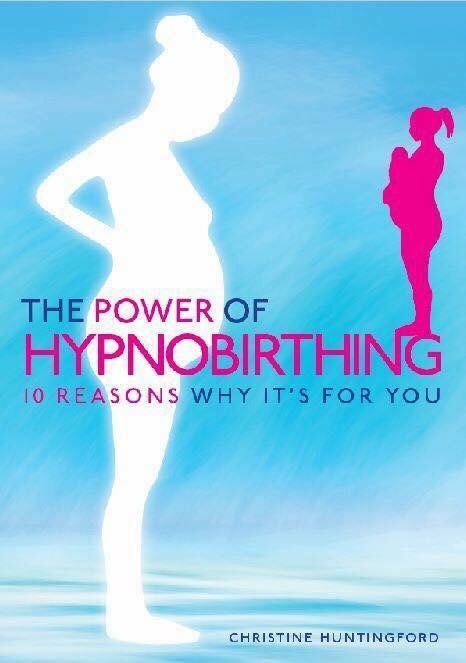 On 1 June 2017, a new book was launched onto the market called The Power of Hypnobirthing: 10 reasons why it’s for you. This introd uctory book explains what couples can expect from a hypnobirthing course – which is an antenatal course that prepares both the mother and her birth partner for late pregnancy, labour, birth and beyond. Quite often the term hypnobirthing conjurs up misleading images and some people feel that hypnobirthing might not apply to them. This book explains 10 reasons why the author believes that every single pregnant mother, regardless of all conditions should undertake a hypnobirthing course. Couples who do leave the course informed, empowered and ready to approach labour and birth with calm confidence. To read a taster of the book, all you have to do is email power@magicalbabymoments.com and we will get the first chapter to you.